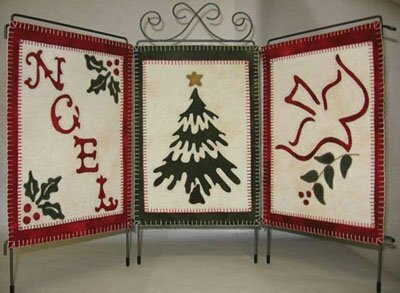 Stitch up this 3-panel 21" x 10" Holiday Trio using a Reverse Applique technique. You will enjoy this on your mantle or table as a focal point during the Holidays. This 16" x 32" pattern includes two original projects by Lori that have been a hit for the fall season ever since she has been designing. Choose the design that best suits your style or home decor. Perfect for the beginner or for a last minute decoration that won't take long to stitch up. Brighten up your holiday season with the classic combination of vibrant red and green wool in this 11 1/2" x 24" runner that helps tie the rest of your decorations together.